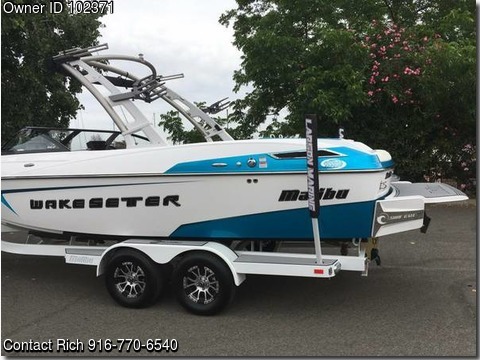 Boat is located in Sacramento,CA.Please contact the owner @ 916-770-six five four zero...Hey I have a 2016 Malibu 23LSV with a full $8k Exile Audio stereo system. It is mainly white with Malibu BLUE METALLIC near the transom and white/blue seats. Included is a white malibu tandem axle trailer with upgraded rims. 12inch woofer tucked nicely under the dash, equilizer nicely stored inside driver side storage glove box, 4x SXT 9inch Tower speakers and 8x interior speakers. This stereo is LOUD and crisp because it was installed/tuned by Pure Audio out of Fairfield, CA! great team! If you know the 23LSV, then you know it is a SURF boat. In addition to the stock ballast system and Malibu surf gates, I have 2x 750lb fat sacks in the rear of the boat to really weigh it down to great a HUGE surf wake behind this boat. This boat also has a rear view camera so you can see the rider on the huge touch screen on the dash. I am only selling this boat because I am buying a house soon and I am cutting down on the toys. I have barely used this boat as it was purchased in June 2016! It has about 37hrs on it now. Please let me know if you are interested. txt/call rich @ 916-sevenseven0-6five4zero and I can send you more pics.